The New Year often comes plenty of resolutions we rarely keep. This year, do yourself a favour and decide to get your home — or office — decluttered. Decluttering has many benefits, such as helping to reduce anxiety, keeping you focused and also saving time whenever you can find things easily. You can even drum up some extra cash if you discover items you can sell. 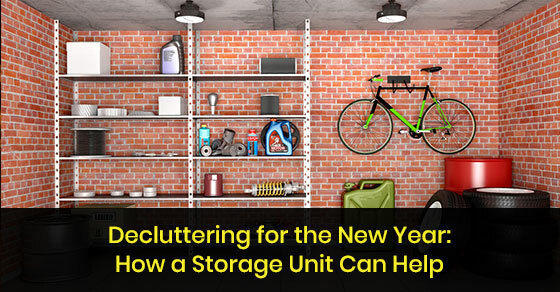 A storage unit can help with your decluttering efforts, helping you to make this one New Year’s resolution you keep. Excess things in your life cause clutter. Visual clutter leads to a cluttered mind. If you keep your home free of clutter you are reducing the number of things that are fighting for your attention. A clean room allows you to decrease the things your mind is trying to process, allowing you to focus on more important things. Although you might envision a New York artist living amongst the clutter of their Soho loft, maintaining a minimalist environment actually enhances creativity. Chances are their ‘clutter’ is probably mostly works in progress and the tools of their trade, which is not really considered clutter. Because your mind is not preoccupied with clutter in the room it can thrive and become more productive, getting those creative juices flowing. As a result of your newly found Zen state and improved focus, you will have less anxiety and also a smaller list of things you have to clean. In fact, studies have found that if you sleep in a cluttered room you have an increased risk of developing sleep issues and disturbances. Clutter is “visual noise” which can make you edgy and cranky. It can also make your space seem smaller and cramped, which can set you permanently on edge. Decluttering also frees up both storage space and living space making your home more comfortable and appealing. When you really look at your closets, garage, condo storage space, attic, basement, etc. you will see how badly you need to declutter. This includes your dresser drawers, kitchen drawers and cabinets, shelving units, wardrobes, etc. This is a major part of decluttering, as often things stored in the home are out of sight and so out of mind. By going through everything you have stored in every room, cubby hole and box, you can rid yourself of anything you don’t need, freeing up space for the things you do. These are the things you need, want and use every day, or on a regular basis. A good rule of thumb is if you haven’t used it in the last couple of months, you don’t need to keep it out. These are the things you need, want and use but only do so sporadically, such as holiday décor, winter clothing and equipment, seasonal sports and outdoors equipment etc. This is anything you haven’t used in ages, that is broken or serves no purpose whatsoever. This toss it pile can then be sorted into trash, or if it is still in good condition and could be used by someone, donate it to an appropriate charity or thrift store. These tips will help you become a decluttering expert and have bragging rights you actually kept one of your New Year’s resolutions. If you’d like more information about storage units, call Jiffy Self-Storage at 416-745-4339 or contact us here.